Tradeoffs have been proposed in the literature as an approach to resolving over-constrainedness in interactive constraint-based tools, such as product configurators. It has been reported how tradeoffs can be modeled as additional constraints. 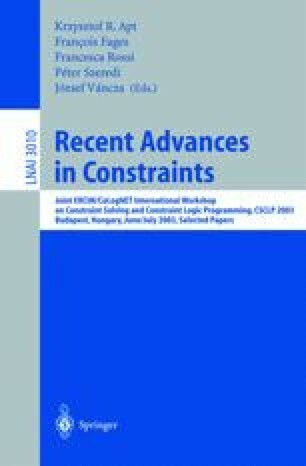 This paper presents a formal framework for tradeoff generation based on the semiring approach to soft constraints. In particular, user preferences and tradeoffs are, respectively, represented as soft constraints and as an entailment operator. The entailment operator is used to interactively generate new constraints representing tradeoffs. The framework we present is well-motivated by real-world approaches that exploit tradeoff generation in online buying and configuration processes.